Introducing the New Colours of Staron® - Supreme™ Collection. I'm always on the hunt for new products in different colours so I can offer my clients the most suitable option for their home. Solid surface bench tops provide the affordability and ease of maintenance that natural stone simply can't compete with. The designs have become so realistic and so beautiful it's made them the easy choice for your average kitchen remodel. Let me share with you all the 10 new colours that Staron Solid Surfaces have just released. The colour is inspired by the elements of a quiet countryside with clear air. The shapes of field and sky are minimised to a hue that expresses an earthy simplicity. When the waves break on the shores of a white beach, the foamy water droplets splash apart into organic forms that feel refreshing and natural. In the same way, this pattern emits a subtle shimmer that creates a fresh atmosphere. This colour brings to life the sublime purity and spirit of white. It features the many definitions within white and it transforms a space with a crisp white background and subtle soft white waves. This colour combines the duality of a soft white cloudy sky and the grey of the city cement, and soft patterns and cool colours create a soothing environment. This colour contains deep rich deep browns that express a luxurious and peaceful feeling. With dark earthy tones highlighted by lighter sandy patterns, this colour will create an opulent atmosphere. This colour echoes nature’s soft and lasting limestone, and combines tone-on-tone colours and patterns in a gentle feathery embrace that creates a safe and warm space. Even the bustle of city life is silenced by the calm warmth of dawn. This pattern emulates rhythmically divided concrete exteriors with re-interpreted greys that produces a tranquil modern space. Peeking out shyly like the delicate buds of white blooms that have caught drops of moisture in the morning mist, this colour features fine particulates and a soft smoky haze that creates serenity to any application. Comprised of warm earth tones from nature’s palette and patterns in organic forms, this colour creates an inviting natural atmosphere that is refined. The dark night, deep sea, and moonlit waves are united in a pattern of black, blue, and green shades whose unknown depths reflect the wonders of mystery. Presto will create a luxurious and distinguished atmosphere to any space. Have you used Staron in your kitchen or bathroom? What's been your experience or favourite colour? Have you used Staron in your home? Please comment and share your experience or tips with us all. I saw this gorgeous copper wire pendant at Jamaica Blue Coffee shop the other weekend and it got me thinking about the different ways you can quickly add the industrial look into your home. I am quietly a bit obsessed with the industrial style. 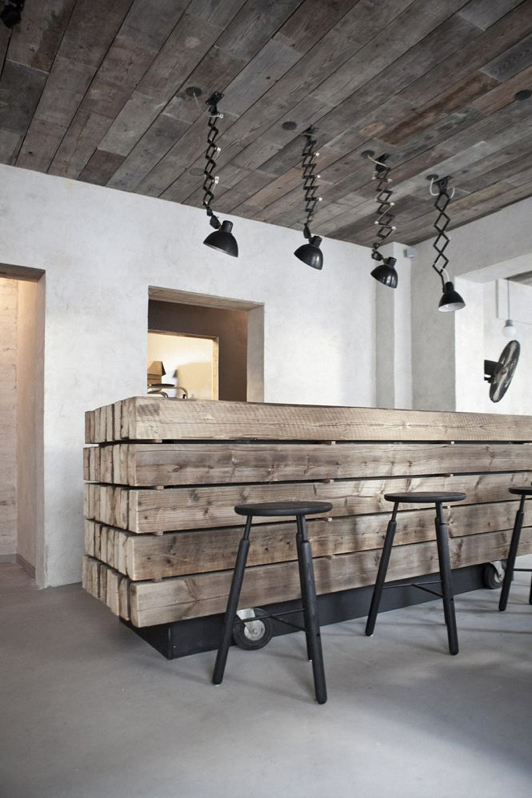 I love the contrast of black and white, and the texture of exposed timber and metal. It feels so authentic. Its a style that allows for personal touches. It’s not just enough to have white walls, you have to have the RIGHT white walls. The key to an industrial style interior is using a cool white as it makes everything look bright, clean and crisp. A cool white absorbs less light, so it therefore bounces more light around the room. Which is all part of achieving an industrial look. The industrial look is all about creating contrast in colour. Bright whites against charcoals and blacks. I love how much impact you can have with colour. 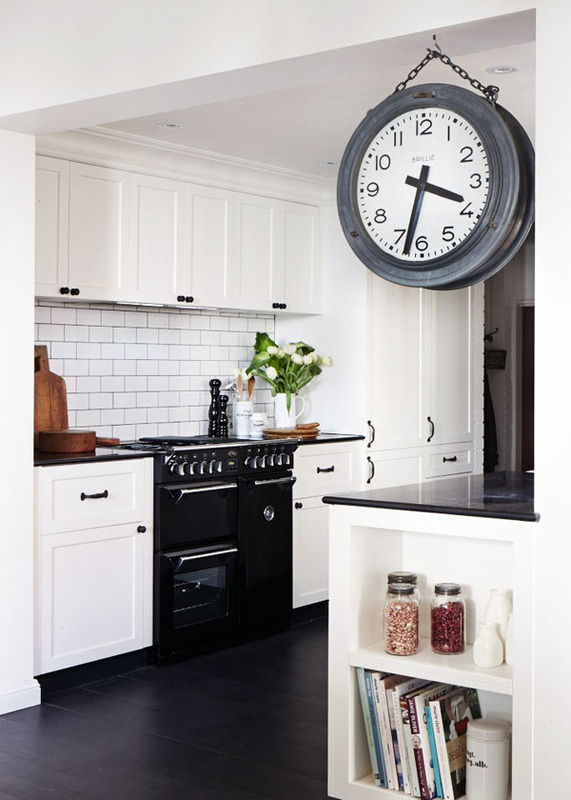 By simply painting your doors or skirting boards in Black you can create a bold statement that’s very industrial-esque. What I love even more is it’s easier to paint your trim than your walls because you don’t have to move any furniture out of the rooms. And paint is soooo cheap. You can always change your mind, so be brave and go black! Try Dulux Domino to get you started. We are very lucky here because cage and wire pendant lights are so on trend at the moment you can pick one up in any lighting shop. The reason cage and wire pendant lights are industrial is because the industrial look is all about raw and exposed features. You are trying to make your interior look stripped back to the bones – exposing the elements we normally hide and beautify. Industrial spaces are often quite open plan with high ceilings so you want to make sure your wire pendant doesn’t get lost because its so small. Because it is essentially see-through it almost needs to be twice the size to make you notice it. Similar to the reason above, you may need to use multiple pendants in a cluster or group to create a bigger statement. The other reason for using multiple lights is to provide more artificial light. The cage and wire pendants often don’t provide as much light as a regular one with a shade or case. Because there is no lamp shade to direct the light you may need to use more lights or brighter bulbs to illuminate your space enough. Because your bulb is completely exposed it needs to be attractive. This is not the type of light where you should use a fluorescent bulb. There are lots of decorative bulbs available in different sizes and brightness so do some research first. But remember there is no harm in using a cage or wire pendant for pure aesthetics, just make sure you supplement with downlights for functional ambient light. 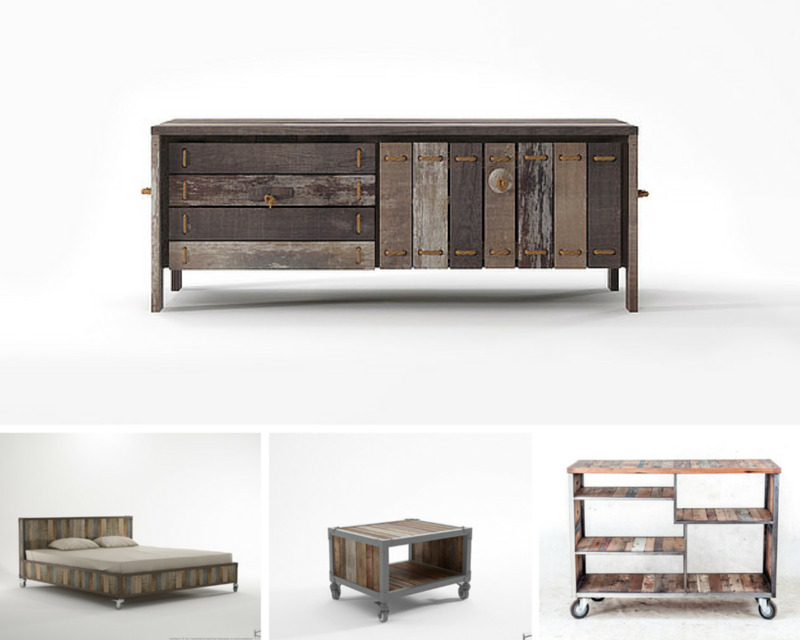 To help create your ‘exposed’ feel of an industrial interior I strongly recommend using recycled timber. It doesn’t have to be for floorboards, you can use it in furniture and accessories too. Once you start looking for it you will start to find it everywhere, from furniture to mirrors and lamps. If your really stuck check out local markets, etsy or approach a local carpenter and get him to make you something. If you’re feeling hands-on check out Pinterest for lots of DIY ideas. Not everyone has the ability to pour a concrete floor, particularly because of weight bearing issues. But don’t be disheartened! The concrete look tiles are quite realistic and beautiful. They often come in large sizes which makes it look less like a tile. I would recommend not going too big, because your tiler will hate you and probably charge you for it! Can you imagine how heavy a 1mx1m tile would be to carry!? This is probably the cheapest thing you can do to your interior, but it will give it a complete makeover. Update your door handles and knobs with industrial style ones. For the full effect I would be going for a matt black look, but a matt silver/bronze/copper could also work well. Just avoid anything chrome. I love the ones at Early Settler, but you could also check out Tradco or any local hardware shop. Here are some of my favourites from Early Settler. Nothing says industrial like the strong contrast of black and white. And what better way to achieve this by filling your empty walls with cool photos and prints. Black photo frames on white walls are very striking, and because its monochrome you can mix a whole bunch of styles and sizes and it will still look cohesive. What's your favourite industrial element? Are you into monochrome, timber, stainless steel or exposed brick? I would love to hear your thoughts in the comments. I’m not entirely sure why, but everyone (myself included) seems to love Scandinavian style interiors. Perhaps we can thank IKEA for why the interior design style ‘Scandinavian’ has become so popular. Or perhaps it’s because of the resurgence of ‘mid century’ furniture, which the Scandinavians do so well. What we do know is that the design ethos from the Scandinavia region is simplicity, functionality and minimalism. Some of you might be asking who or what exactly is Scandinavia? It is the northern European region of Denmark, Norway, Sweden, Finland and Iceland. I could go on and on about my love for Scandinavian interiors, but I might save that for another post. Let’s just get to business. If you want to inject a bit of Nordic style into your home then I’ve got you covered. Check out my shopping list for how to get the Scandinavian look for less! Scandi makes me feel solo cosy. What Scandinavian style products have you seen around? Have you found some beautiful fabric or a gorgeous cushion? Or do you have any other questions about your own renovation? Leave a comment below and we can all chat about it. Now that we’ve hit winter... well, as much winter as sunny Sydney gets! I’m starting to really feel a craving towards the beautiful rich tones of marsala. Either that or I’ve just had too many vinos. But I must say, I am really loving the contrast it plays against all the metallic’s that are available at the moment. With copper and brass being so ‘hot’ (excuse the pun) it really opens up some great decorating opportunities. So I have pulled together my pick of on trend Marsala products to transform your home this winter. I'm seriously obsessed with those meltdown lamps. What Marsala themed products have you seen around? I’m going to let you in on a little secret – I love finding productivity tools! Being a working mum, my time is so valuable! So if I can use something to make it easier or quicker…I’m all over it like sprinkles on a donut. I’m a sucker for shortcuts. Especially on my mac! I’m the queen of Command>Tab, Command>c, Command>v (if you’re like me then you’ll love this article written by Matt Gemmell). So I’ve collated a little list of some of the apps I have come across on my quest for efficiency. Hopefully this will help you with your latest renovation project. From the quick paint job through to remodelling. Enjoy! My all time favourite App! Suitable for both designers and home enthusiasts. This will be your ultimate inspiration guide when planning any home renovation project. You can create ‘ideabooks’ of rooms you love and then make notes as to what you like about it. It’s like a pinterest just for the home. And is a great tool for communicating your ideas to contractors and suppliers. For the times when hubby can’t fix ‘insert random task here’. Hi Pages will become your lifesaver for getting quotes and finding tradesmen. Most of you are probably familiar with their website which is an online trade directory for anything home improvement related. Well the app is quick and simple to use in the palm of your hand, especially if your internet isn’t installed yet! This is another online directory but it isn’t purely for home improvement related companies, eg find the local coffee or hardware shop. I think it’s slightly more objective because it’s a free directory to advertise in and I like that you can just grab their phone number and call without having to specify the job and request a quote. A super easy App for testing paint colours and probably the most popular of its kind. Simply take a photo of your room, pick a colour and use the paint bucket to apply the colour. A great visualisation tool for choosing paint colours and all the colours can be easily matched at the paint shop. For people nervous about changing their wall colour. You can take a photo of your wall and then paint the wall using 1 of the 400 colours in the Mitre 10 palette. The app is particularly useful for accent walls. If you’re a Dulux lover like me than this is essential. Test a colour that you like in a few template rooms – living, bedroom, kitchen etc. It’s a great visualisation tool for people painting their walls. This is a great App for when you’re out and about and you see a colour you love and want to try replicate it in your own home. Simply snap a photo and then put your finger on the screen to find the closest colour match. I’m a huge fan of Resene paints, they have a beautiful and rich depth of colour. A great tool for picking a stain colour and working out your quantities while you’re at home, not standing confused in Bunnings. It’s a simple app that allows you to browse stain and oil products, then once you have selected one you can calculate the quantities. The best feature for us Mums is it also lets you create a shopping list to make your trip to the shops a lot more efficient. This takes a bit practice but is possibly the simplest way to mock up your house layout within minutes. It’s such an incredibly clever App that will save you hours of measuring, planning and drawing. Perfect tool for homeowners planning renos and people moving home and wanting to test and see if their furniture fits. Another good App for drawing floor plans with basic furnishings. There’s a bit of a learning curve but its worth it for the results. If you want really realistic images then get the paid version and get busy designing a stylish house! This App has a huge range of calculators for tricky projects around the home. Importantly – yes it uses the metric system! For a small price this App will save your hours of painstaking planning. Build stairs, foundations or windows like a pro. The project/time estimator won’t be necessary for everyone but is a very useful feature. Highly recommend! This claims to be ‘the App every contractor needs in their toolbox’ but I think it will be useful to the average home renovator. Calculate and work out your spacing for fences, stairs and decks. Save hours! These are things you don’t want to get wrong, or do twice, so get it right the first time. Boring, but essential. A simple App for estimating how many bags of concrete you need for a slab (based on thickness/depth/length) and how many bags of mortar you need for a brick wall (based on mortar type and number of bricks). Includes a Bonus feature of some DIY projects. Made by Carter Holt Harvey to support specification of their flooring products. You can select the floor product, insert the floor sqm, joist spacing and wastage and then it will calculate the number of sheets required. Probably more useful to the novice home renovator than a professional tradesmen who can do it all in their head. If nothing else you have to download Houzz - its going to rock your world. What other Apps do you use? Do you use any other Apps that your fellow renovators might like? Or do you have any other questions or concerns about your own renovation? Leave a comment below and we can all chat about it.